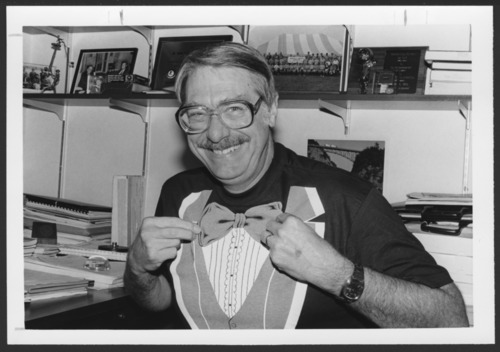 Dr. Walter Menninger is shown wearing a bow tie t-shirt for the United Way Fun Day in 1988. Dr. Walt is known for his bow ties. He was director of the Topeka State Hospital and then succeeded his older brother, Roy W. Menninger, MD, in 1993 as the head of Menninger. He retired at the age of 70 in 2001 and became the chairman of Menninger Trustees.